Can you believe it? While many of our members are in their last days of the school year, just as many have already seen commencement come and go and school is official out! But we all have one thought in common, "where did this year go!" I imagine there are some of us who could tell you where the year had come from, but of course, this is too polite a publication for me to spell that out. Some years are tough and some are tougher! When I was first considering the Assistant Superintendent's job in our district many years ago, I remember the current leader had a sweet little cross-stitched saying on her credenza, "Things will be better next year!" Within a few weeks of the start of that school year in my new position as Assistant Superintendent, an anonymous gift arrived — not the same one, but another cross-stitched saying with those same words! I remember many days sitting in my office staring at the plaque and with all my heart hoping "things will be better next year!" I believe one of the essential elements of character needed for a successful special education leader is the element of eternal optimism! Speaking of Essential Elements... I am so excited to be working with an amazing cross stakeholder group of folks from all around the country on developing a rubric for a Quality Special Education program. The process is being led by one of the former IDEA Partnership Activity Leaders, who is very well trained and very skilled at Leading by Convening. She has said several times what a joy it is to spend an hour with esteemed, competent colleagues brainstorming on just what the vision and reality of a quality special education program looks like. What are the Essential Elements? Why are they Essential? Where will we look to find them? How will we know them when we see them? What is the difference from Not Acceptable to Good to Great/Best Practices? I can hardly wait to tell you more about this project once it is more fully developed! And since it IS June now, be sure you register to do your part in advocating for your students and programs in D.C. this July! Certainly an essential element of our job as special education administrators is to "tell the story" of all the amazing things our staff and students have accomplished this year to those up on the Hill. As the tag line says, "What happens in the classroom shouldn't stay in the classroom. Send the good news from your district to Capitol Hill." We need a team from EVERY state in order to really make a statement! As you enter into your Senator or Representative's office, think what kind of impression you will make when you can say there are teams visiting their Senator's and Representative's offices from all 50 states! Be a leader and not only make sure you are a part of this great event, but make sure you are a part of a TEAM to make an even bigger impact on your state delegation! Go to the CASE website or straight to the Summit website for more information and to register now! Last Week's Poll asked "Who gives you the most accolades?" 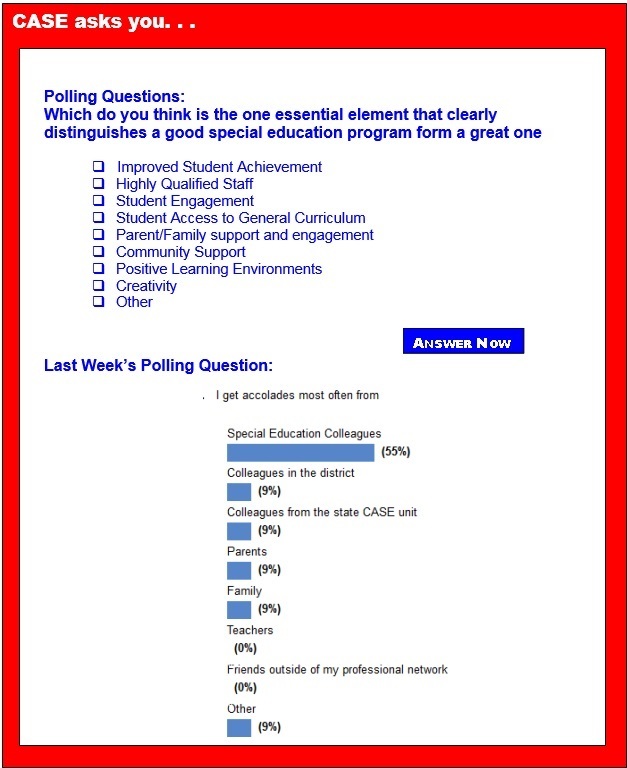 First place at 55 percent of those who completed the poll went to those saying it was their special education colleagues who most often provide you accolades. There was a five way tie for the other areas including colleagues in the district, colleagues from the state CASE unit, parents, family and other! Want to enhance your advocacy skills, learn about important special/gifted issues and early intervention, and take CEC's messages to Capitol Hill? Then come to the Special Education Legislative Summit July 12-15 in Alexandria, VA. Registration is easy, simply visit the Special Education Legislative Summit website, click the registration tab. Join us in July! U.S. Secretary of Education Arne Duncan joined National Institute for Early Education Research Director Steven Barnett to unveil NIEER's State of Preschool Yearbook 2014 at CentroNía, an early learning and community center in Takoma Park, Maryland. The annual report, which includes state profiles and rankings covering the 2013-2014 school year, looks at enrollment, funding and quality benchmarks for state-funded preschool nationally and by state. Earlier this month, the Division for Early Childhood released their position statement on Leadership in Early Intervention and Early Childhood Special Education. This position statement focuses on promoting high-quality leadership at all levels of the early intervention/early childhood special education service systems. Travis Pilcher, 20, didn't talk for most of his life. He was a mystery to his teachers, who couldn't find a way to help the young man with severe autism. By the time he was a teenager, his parents, Michael and Shannia Pilcher of Fort Worth, were exhausted from dealing with his mood swings and aggressive behavior. "When he couldn't get his point across, he became so frustrated that he would explode," Shannia Pilcher said. Three years ago, Travis was chosen to be the guinea pig in a Fort Worth school district effort to equip nonverbal special education students with iPads. Within months, he was swiping symbols on the screen that converted text to speech. He would mimic the sounds he heard from the iPad to talk to his parents. The Common Core-aligned tests that made their debut in 11 states and the District this spring will be approximately 90 minutes shorter next year, a change that comes after parents, teachers and school administrators expressed frustration with the amount of time devoted to the new exams. The governing board of the Partnership for Assessment of Readiness for College and Careers voted to shorten the tests. The board, made up of state superintendents, also voted to give the exams during one 30-day testing window near the end of the school year. A curriculum framework initially developed for special education students is gaining traction in general ed classrooms nationwide during Common Core implementation. Universal Design for Learning is an approach created by a nonprofit that addresses students' individual learning needs to reach standards. Teachers allow students multiple ways of accessing information and demonstrating understanding for each lesson or assignment in order to differentiate learning. The Common Core expects students to demonstrate mastery in multiple ways. According to the National Education Association, the number of U.S. students enrolled in special education programs has risen 30 percent over the past 10 years. Additionally, the NEA reports that nearly every general education classroom in the country includes students with disabilities, as three out of every four students with disabilities spends part or all of their school day in a general education classroom. Teachers: Have you ever had a lesson plan that didn't work the way you wanted it to? Maybe it's because you planned the lesson for yourself. It would have worked fine for someone who learns like you do, but it wasn’t effective for struggling learners. Do you have a student who wrestles with simple assignments? Does he act confused or oblivious when you speak? Does it seem as if he's been blindfolded, spun around, and asked to perform while receiving too much information from a cheering, well-intentioned crowd? Here are several strategies for making things easier for students with ADHD/LD in your classroom. Animals' presence may ease social anxiety in kids with autism NIH-funded study could have implications for treatment. When animals are present, children with autism spectrum disorders have lower readings on a device that detects anxiety and other forms of social arousal when interacting with their peers. According to a study funded in part by the National Institutes of Health, companion animals — like dogs, cats or the guinea pigs in the study — may prove to be a helpful addition to treatment programs designed to help children with ASDs improve their social skills and interactions with other people. Eye training or other vision therapies will not treat dyslexia in children, say researchers who found normal vision among most children with the learning disability. The findings confirm what eye doctors have known for a long time, said Dr. Mark Fromer, an ophthalmologist at Lenox Hill Hospital in New York City. "Dyslexia is a brain dysfunction, not an eye disorder," said Fromer, who was not involved in the study. "There are no studies that clearly identify that visual training can be helpful for the dyslexic patient." The number of U.S. children and teens being treated for mental health issues has risen by about 50 percent in the past 20 years — with most of those kids having relatively mild symptoms, a new study finds. The research, published in the May 21 issue of the New England Journal of Medicine, comes at a time of growing concern over young people's mental health treatment. In particular, some worry that kids with milder issues are being overtreated with antidepressants, stimulants (such as those used for attention deficit hyperactivity disorder) and antipsychotic drugs, said lead researcher Dr. Mark Olfson, a professor of clinical psychiatry at Columbia University in New York City. When I talk with educators across the country, they often lament that students don't read much anymore, especially in the face of ubiquitous social and multimedia distractions. Even students with intact decoding and fluency complain that reading is just too hard, not worth the effort. Why is reading such a challenge for so many? One often overlooked factor is the role that executive function plays when we engage with text. Broadly put, executive function describes the cognitive processes that regulate self-directed behavior toward a goal. The topic of metacognition can seem quite abstract — a complex concept for students to embrace. But it is worth the effort to develop a metacognitive mindset in setting goals for learning and in monitoring progress toward achieving those goals. For teachers empowering students to think about their thinking with the aim of improving learning, it can be truly inspiring when they see the resulting changes in students' motivation, resilience and learning gains.